Each of the 15 voices has a multimode Filter section. Each filter is disabled by default and can be enabled by clicking the power button in the top left corner. There are three filter modes available: Low Pass, Band Pass, and High Pass as well as Gradualand Steep slope control (12 and 24 db/octave respectively). The Freq knob controls the filter cutoff frequency. The Reso knob controls the resonance of the filter by boosting the cutoff frequency. 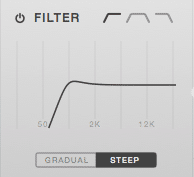 You can also click + drag on the filter graphic to adjust the cutoff and resonance (drag left/right to adjust frequency and up/down to adjust resonance).